Note: The socket base of the 507320 is similar in size to that of a table lamp socket. 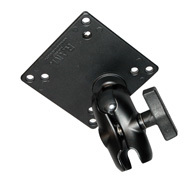 The ratchet base mount was designed to allow the positioning of your Black Light to virtually any flat surface. This part may be attached to the unit adapter for our magnetic particle inspection equipment. The Handle Adapter attaches our standard Black LIghts (ZB-100, ZB-100F, ZB-150FSB) to other modular black light fixtures we have availalbe. No need for special tools or drilling. 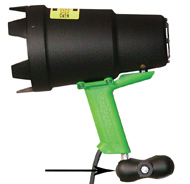 Flat Base Mount (p/n 622593) allows hand-held Black Light to be mounted from the ceiling or any other flat surface. 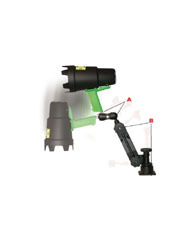 The extension components are used when the Black Light needs to be closer to the inspection. This extension is 7-1/2" in length. The extension components are used when the Black Light needs to be closer to the inspection. This extension is 5-1/2" in length. This fixture combined with the Ratchet Base Mount can be easily attached to either the back or the front lip of our wet bench units. Black Light can be slid and locked to any desired position along the wet bench unit. 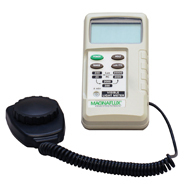 Certified White Light Meter comes with Meter, a permanently affixed white light sensor, battery and carrying case. Calibrated and Certified specifically for NDT use! Accurately measures visible light by foot candles and lux.